Toms professionals have had enough on field experience to enlighten people for their cleaning queries. In this article we discuss the top 5 upholstery cleaning myths that ride most of the people’s minds. This is myth #1. Proper upholstery cleaning does not only removes the dirt visible to the naked eye; but it also removes the harmful microscopic microbes and pathogens that might be hidden in or under your upholstery. Things such as bacteria, dander, mould spores, and other allergens consist these microbes that we can’t see with the naked eyes. Upholstery cleaning freshens up the fabric with group fragrant, making it feel softer and look brighter. This is not true! This myth could have taken place because of prevalent cleaning methods, such as scrubbing. The harsh bristles of the scrubber that can lead to deterioration of the upholstery fabric, understandably. But an experienced, professional upholstery cleaning service provider would never use these methods. At Tom’s cleaning we 100 organic and advanced methods. Our cleaning methods are tailored according to the type of upholstery fabric. That’s simply not true. The work ethics depends on person to person not on the upholstery cleaning company. There is always something unique a company offers to stand out from the rest. For instance all our complicated cleaning method are executed using material that are 100% organic. Myth #4: Can I just DIY Upholstery Cleaning? Although it is possible for you to clean your own upholstery using commercially available cleaning solutions and rented equipments, chances are prominently high that your efforts will not produce the same results as a professional upholstery cleaning service. Why, you ask? Because a professional upholstery cleaner has the leverage of training and experience but obviously. and because the equipment we use is of much higher quality. You payed hefty amount for installing the furniture and sculptures around your house to make the house look good. As time pases your upholstery goes dull and your sofa doesn’t look as good as it is supposed to. The cleaning fees for your sofa upholstery would be but obviously quite less. 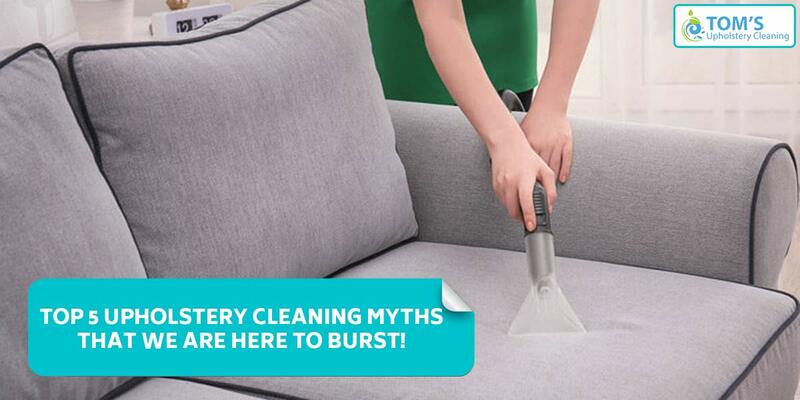 With that we just bursted the final of all upholstery cleaning myths!